Looking for more hilarious movies like Captain Underpants: The First Epic Movie? Check out these five flicks that will have you ROTFL! As you know if you checked out our First Epic Movie trivia post, the Captain Underpants movie is an upcoming computer-animated flick that features a superhero theme with a dash of comedy. The movie will be in theaters on June 2, 2017. Here are some movies like Captain Underpants: The First Epic Movie. Affiliate links included below. Thanks for your support! Don’t wait in line for your tickets! Buy them now from Fandango! Diary of a Wimpy Kid is a 2010 comedy movie that is based on the 2007 book of the same name by Jeff Kinney. It is the 1st movie in a series of 4: 2011- Diary of a Wimpy Kid: Rodrick Rules, 2012- Diary of a Wimpy Kid: Dog Days and 2017- Diary of a Wimpy Kid: The Long Haul. Greg Heffley is a teenager who is trying to deal with the transition from elementary school to middle school. Diary of a Wimpy Kid stars Zachary Gordon as Greg. How to Train Your Dragon is a 2010 computer animated action, fantasy movie that is based on the series of 12 books by Cressida Cowell. It is the 1st movie in a series of 3: 2014 How to Train Your Dragon 2 and How to Train Your Dragon 3, due in theaters March 1, 2019. Hiccup Horrendous Haddock III is a young Viking, who dreams of being a dragon hunter. That is until he meets and befriends Toothless, a young dragon who changes his belief about dragons. How to Train Your Dragon features the voice of Jay Baruchel as Hiccup. Madly Madagascar is a 2013 computer-animated comedy movie, with the events of the film taking place during the 2008 movie Madagascar: Escape 2 Africa. It features the characters Alex, the Lion; Marty, the Zebra; Melman, the Giraffe and Gloria, the Hippo as they celebrate Valentine’s Day. Madly Madagascar features the voice cast of Ben Stiller as Alex, Chris Rock as Marty, David Schwimmer as Melman and Jada Pinkett Smith as Gloria. Monster Trucks is a 2016 action comedy movie. Tripp Coley is a high senior who uses parts from scrapped cars to build a Monster Truck. He encounters an unlikely subterranean friend, the result of an oil-drilling site accident. Monster Trucks stars Lucas Till as Tripp. The Boss Baby is a 2017 computer-animated comedy movie that is based on the 2010 picture book of the same name by Marla Frazee. Theodore Templeton, a baby with a briefcase and his older brother, Tim Templeton, team up against Francis E. Francis, the evil CEO of Puppy Company. The Boss Baby stars the voices of Alec Baldwin as Theodore, Tobey Maguire as Tim and Steve Buscemi as Francis. 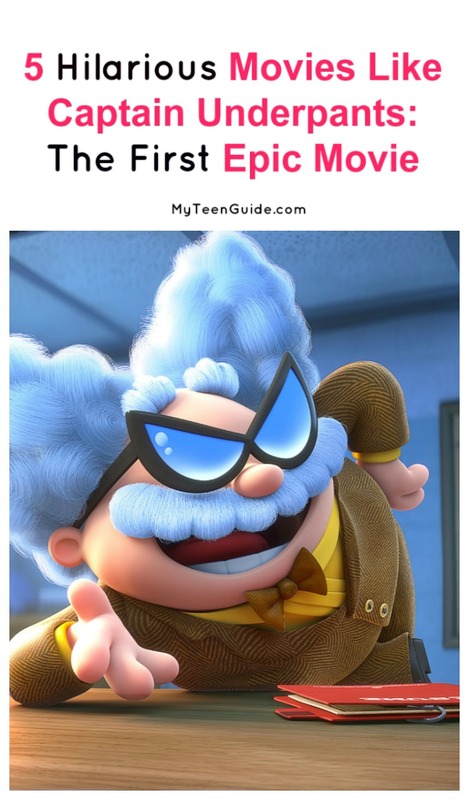 Have you seen any other great movies like Captain Underpants: The First Epic Movie? Share below! Myteenguide is a participant in the Amazon Services LLC Associates Program, an affiliate advertising program designed to provide a means for sites to earn advertising fees by advertising and linking to (“Myteenguide” (amazon.com, or endless.com, MYHABIT.com, SmallParts.com, or AmazonWireless.com).